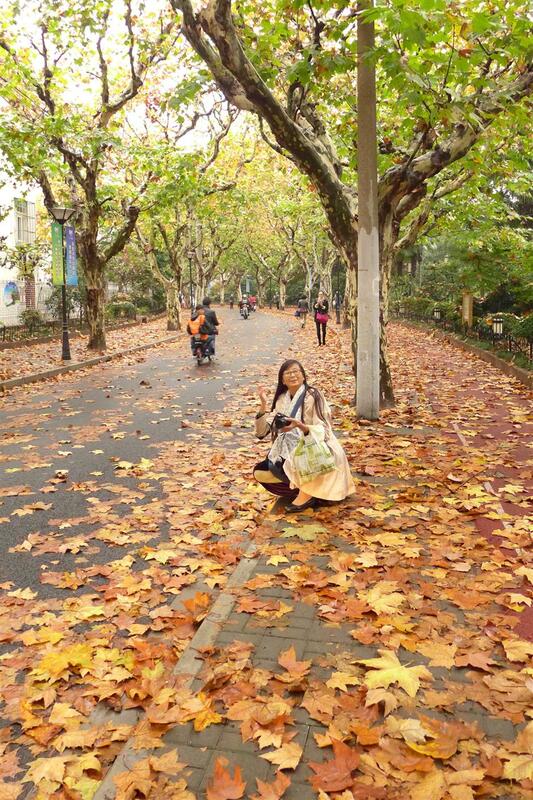 Autumn is for outdoors, and the fallen leaves on Shanghai's streets make for a spectacle that is enjoyed by both locals and expatriates alike. For Americans, the sights, sounds and smells of autumn bring to mind the start of a new school year, the harvesting of crops, the picturesque changing of leaves and the unfathomable feelings associated with the season. In the months of fall, the average American will indulge in his or her pumpkin spice latte while spending a weekend at an autumn-themed fair. Shanghai may feel different from home, but the city and its people share a lot in common with their American counterparts. In Shanghai, for almost two months the trees change color and fall on the ground, making for an enjoyable spectacle that is enjoyed by both the locals and expatriates. In certain areas of the city, fallen leaves will stay in situ from today to early January to “retain the seasonal scenery,” according to local greenery authorities. The streets include Sinan, Julu, Hunan, Wukang, Yueyang, Yuqing, Liyang, Siping, Yongfu and Hengshan roads, as well as Fuxing Road W.
Any expat will easily notice the abundance of professional cameras employed by locals here — all for seemingly mundane views. Nowhere is this easier to spot than in the public parks, especially during the ever-enticing beauty of harvest or blooming season. A woman poses amid fallen leaves in downtown Shanghai. As the fallen leaves blow away, 4-year-old Zhao Yuyun, nicknamed Benben, impatiently squirms, not wanting to pose any longer. But with the yellowing of plane tree leaves and the slow crimsoning of other trees, Zhao must wait for the freedom to play around as his mother has hired a photographer to capture the precious moments. “I like the fall and winter months as they are most suitable for my child’s pictures," said the mother. Just as in the United States, the idea of taking pictures or portraits among the multi-colored fall leaves is just as prominent in China. “Photography is the art of light. Light rays give us the appearance of images, while differing colors of foliage act as a foil helping to create a distinct picture,” said Yan Bo, a professional cameraman with Shanghai Television Station. As many Americans have experienced raking leaves into piles and the joy of burying themselves in them, it is an experience rarely found in China as very few Chinese have lawns or grass to worry about. But Shanghai’s parks have areas of grass, allowing us to lay among them in warm sun rays and the crisp smell of freshly fallen leaves. 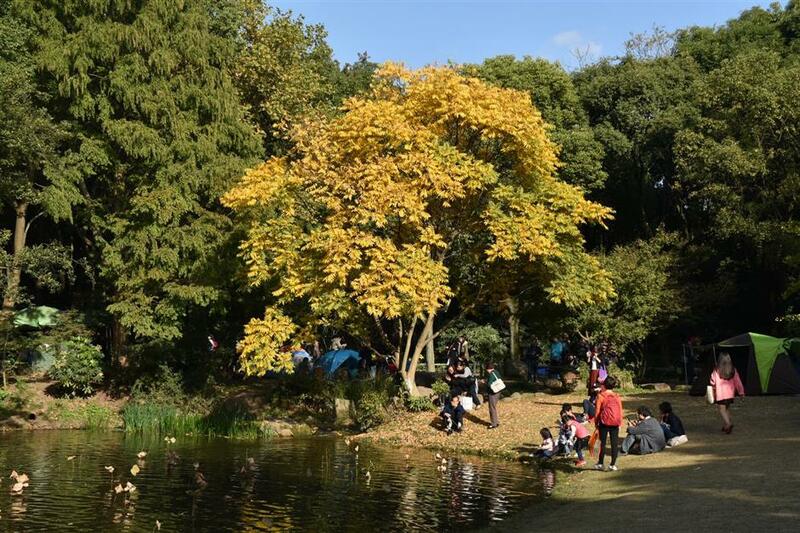 One of Shanghai’s larger parks in the northeast of the city, Gongqing Forest Park (2000 Jungong Rd) draws scores of Shanghai folk during weekends and on beautiful sunny days. In any of the park’s fields, it is common to find a multitude of groups literally setting up their individual camps with tents, blanket spreads, hot water heaters and large assortments of prepared food. People relax by the lake at the Gongqing Forest Park in northeast Shanghai. But there is a noticeable amount of garbage left behind. Shanghai’s problems are inherently magnified by the sheer size of population although this pales by comparison to the beach problems in New Jersey brought on by beach-goers bringing their own tents, music systems and grills to cook, known as “man-spreading,” or the thousands of kilograms of trash left by drunken party animals on Christmas Day on a beach outside Sydney, Australia. It is obvious that the majority of us who no longer work the fields or have become separated from it, there is a strong desire to venture out, experience the changing colors of the leaves and enjoy the elements of autumn at its fullest. 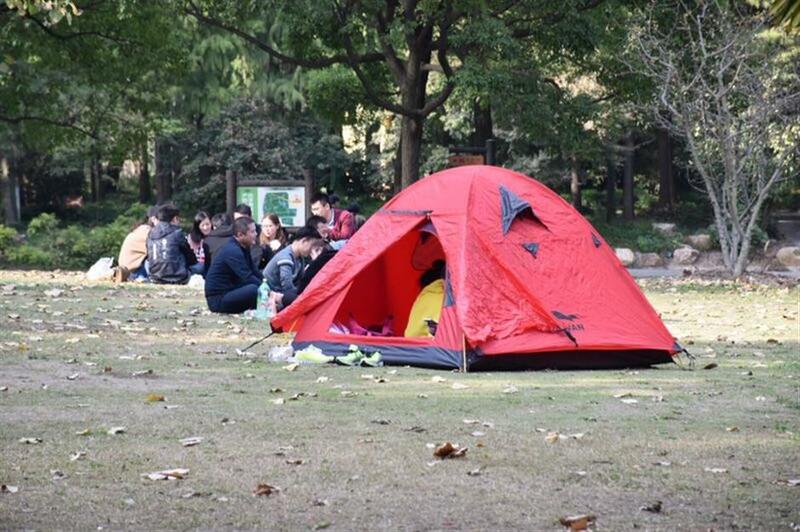 Tents are set up in the Gongqing Forest Park.